Mood Stress Balls are available in blue to light blue, purple to pink, green to yellow, orange to yellow. 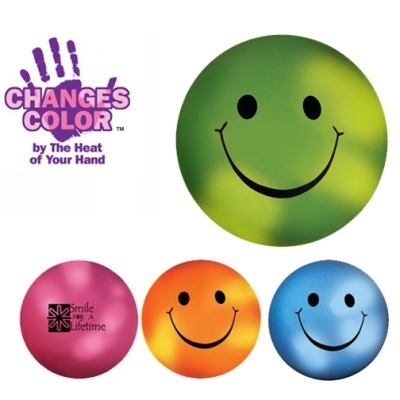 Mood Smiley Face Stress Ball is 2-1/2" diameter with a 1-3/8" imprint area. Mood Smiley Face Stress Ball has smiley face stock imprint on 1-side. 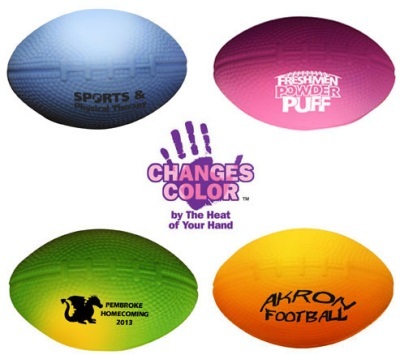 Mini Mood Stress Football is 3-1/2" long with a 1-1/2" wide x 3/4" high imprint area on a textured material.